By now, you have likely gathered that the last weeks, months, years have been difficult for me and my little family. This has been true for a number of reasons. It has seemed that Jordan and I have been slogging through thigh-deep mud for a long time, an unrelenting wind impeding our progress. Lately, though, something has shifted, ever so slightly. At the beginning of January, I wrote a post in which I expressed a longing for this to be a year of answered questions. It is only February, and it isn't that I feel that I have any answers, exactly. Yet, I feel that I am being cared for. I feel that the universe, that God, is caring for me. I feel safe asking the questions, safe turning the possibilities over and over in my minute mind. More importantly, I feel bold enough to poke my head out of my shelter, to look around, and venture out into a world that seems at once so old and so new. I have been slowly reading Annie Dillard's Pilgrim at Tinker Creek. In it, she bravely confronts the cruelty of the natural world. Despite her utter astonishment at it's unimpeded horrors, Dillard is constantly reminded of the overarching beauty of it all. Nature, she tells us, is extravagant. It spares no expense, either on its own behalf or on ours. It takes all and gives all. It has occurred to me that in this taking and giving, we are ultimately always being cared for. My friend, Jonny, told Jordan and I last night about towers of plankton. When faced with dwindling resources, the plankton will stack themselves on top of one another, using themselves as the building blocks for a tower. When a wind comes, the top 10 percent of the plankton are blown to another resource-rich environment. The remaining 90 percent will die. Ah, friends. "...though nothing is lost, all is spent." Today, a recipe from the astoundingly lovely Feast by Sarah Copeland. Jordan gave me this cookbook for my birthday at the end of January and I have been staring at it nearly every day, turning it over in my hands, imagining the tastes and textures of each recipe. I wanted to share a tidbit of Sarah's genius with you. So, I give you her Artichoke Enchiladas. Enjoy. 2. 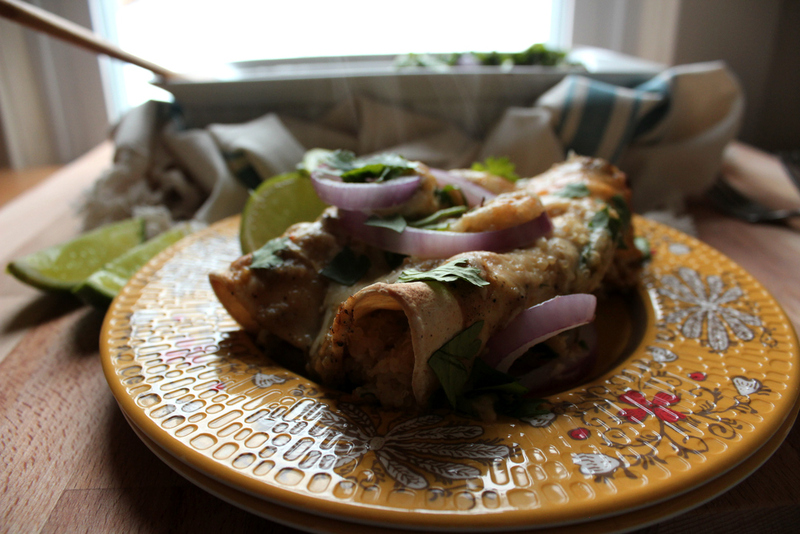 To make the enchiladas: Lightly brush a 9-by-13-inch (23-by-33-cm) baking dish or casserole with olive oil. Preheat the broiler to high. 3. Halve the onion. Slice one half into thin rings and cut the other half into wedges. Arrange the onion wedges, tomatillos, and serranos on a baking sheet and broil until the tomatillos are soft and browned, 15 to 20 minutes, turning with tongs halfway through cooking. Transfer the onion, tomatillos, and serranos with any of their liquid to a blender or food processor, add the stock, and purée until smooth, about 3 minutes. Add 1/2 teaspoon salt and the sugar and pulse a few times to combine. 4. Meanwhile, toss the artichokes with the 2 tablespoons olive oil in a bowl and season lightly with salt. 5. Steam or warm the tortillas in the microwave (wrap a stack in barely damp paper towels and microwave for 20 to 30 second, then wrap in a kitchen towel to keep warm); keep them wrapped. Toss the artichokes and quinoa with two-thirds of the Monterey Jack in a bowl. Place a tortilla on the work surface. Spoon 2 to 3 tablespoons of the artichoke mixture down the middle of the tortilla, add some cilantro leaves, and roll up the tortilla, leaving the ends open. Tuck the enchilada, seam-side down, into the prepared baking dish. Repeat with the remaining tortillas and artichoke filling, lining up the enchiladas side by side in the baking dish. Broil until the tortillas are crisp and golden around the edges, 3 to 4 minutes. 6. Pour most of the tomatillo sauce over and around the sides of the enchiladas and sprinkle the remaining Monterey Jack on top. Broil until the cheese is golden brown, 1 to 2 minutes more. Remove from the oven and top with the sliced onion, Cotija, and remaining cilantro. 7. Divide the enchiladas among plates and sprinkle them lightly with cayenne. Serve warm with lime wedges. *Note: The beauty of the artichoke filling is that it will truly work with whatever artichokes you can find, from fresh to frozen or even canned. If all you can find is marinated artichokes, drain your artichokes and pat dry, and skip the step of seasoning the artichokes before filling your enchiladas. Have a lovely weekend, dear friends. I hope that you experience the extravagance of all that is around you, that you feel cared for in even your deepest marrow.